I am not sure where to start, I can say that I absolutely loved this story, I finished it about four hours ago and I am still teary thinking about it and the people that I got to know Alina, Tomasz and Alice and what they went through, MS Rimmer has knocked my socks off with this story, so many emotions and feelings running through the story, I do highly recommend this book, truly it is powerful and beautiful and should not be missed. Alina and Tomasz grew up together in a small town in Poland, it is 1939 they both knew from an early age that they were meant to be together and Tomasz was going to be a Doctor like his father, he has a younger sister and no mother. Alina lives on a farm with her parents and twin brothers, her older sister lives in town with her husband. Just before Tomasz leaves for Warsaw and college he proposes to Alina and makes a promise to her, but then everything changes as the Nazis invade Poland and their lives will never be the same. It is now 2019 and Alice and her husband Wade, daughter Callie and their son Eddie who has autism spectrum disorder are coping well living in Florida, that is until her beloved grandmother suffers a stroke, unable to talk she uses Eddie’s I-Pad to beg Alice to find the box of treasures that she has had for many years and take a trip to Poland for her to find what has happened to some of her loved ones. This is such a moving, powerful and amazing story, MS Rimmer took me back to Nazi occupied Poland and what they went through, she showed me the courage and strength that Alina and Tomasz and many others had, so as they could do what they did, the struggle and the pain but also the love that they had, that lasted a lifetime. Then there is Alice and her struggles with her family, the love that she has for them and what she was prepared to go through for her Babcia, that trip to Poland was a real eye opener for Alice and the tears I shed just kept coming, the secrets that she uncovered, the truths that were learnt and the depth of love and what the people went through during WW2. I hope I have done this book the justice it deserves, this is a story that is going to stay with me for a long time to come, it was an emotional journey, very, but it also showed what love strength and courage people have to do what must be done, thank you MS Rimmer for an amazing story, a story that I highly recommend, one that should not be missed. 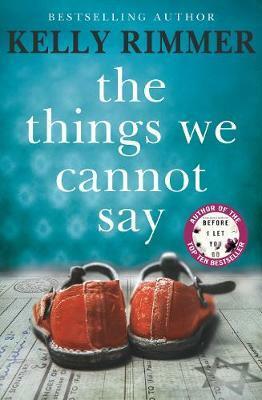 Sign into Goodreads to see if any of your friends have read The Things We Cannot Say. Yes I think you did it justice, looking forward to starting it on Sunday. Claire wrote: "Yes I think you did it justice, looking forward to starting it on Sunday."